SPEEDFIT Manufacturers part number: PEMSTC1514. 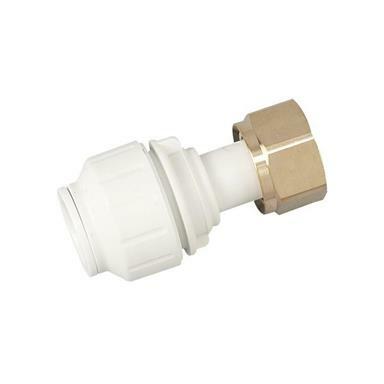 JG Speedfit Straight Tap Connector: 15mm x 1/2" BSP, White. - Push-fit demountable plastic fitting for the connection of plastic and copper pipe to a male thread appliance - ideal for the connection of taps and toilets, ensures an easier working environment in confined places and removes the need for hot works on site. - Suitable for hot and cold water and central heating systems. - Grip & Seal connection. - Lead free and non toxic. - No scale build up, corrossion free. - BSI and WRAS approved.